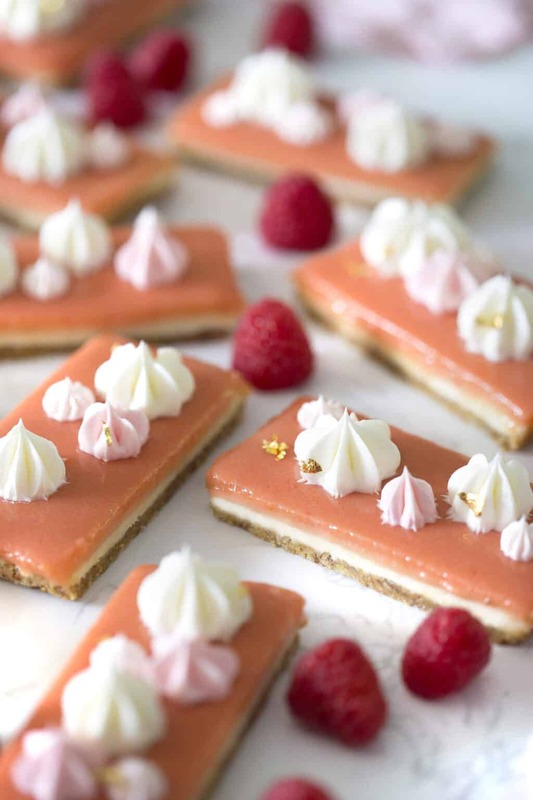 These scrumptious raspberry bars have a toasted pecan graham cracker crust base, topped with cheesecake and raspberry curd layers all crowned with beautiful Swiss meringue buttercream dollops! I made a batch of no bake lemon bars a while back and they were just delicious! I just happened to have a ton or beautiful fresh raspberries on hand so I made some raspberry curd bars! I added toasted pecans to the base and it was amazing! The curd itself is super zingy and oh my gosh the Swiss buttercream dollops are EVERYTHING! They’re so creamy and a perfect complement to the curd! My mom was visiting me while I made these and she said it was my best recipe yet, so you know it’s a must try! I kind of cheated with the raspberry curd by adding a bit of corn starch and flour but I have zero regrets! It set perfectly and there’s no way anyone will fault the taste. If you’re not a big fan or raspberries, other fruits like strawberries, could be substituted in without a problem as long as you’re just adding the juice of course. I used orange blossom water to flavor the Swiss buttercream but it can be hard to come by so feel free to add a dash of vanilla instead. 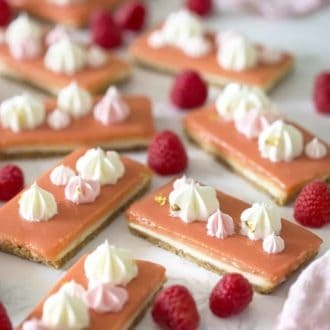 Are raspberries tart or sweet? Raspberries are both sweet and tart! I would describe the taste as zingy. They pair well with lemons and help to brighten up sweet substances like buttercream! As long as you keep the bars in an airtight container they should be fine hanging out in the fridge for a few days. But I promise they won’t last long at all. Crush the toasted pecans in a plastic bag with a rolling pan. In a bowl, add toasted pecans, sugar, salt and graham crackers. Mix together. Press mixture into 3, foil-lined rectangular loaf pan sheets. Chill while you make the cream cheese mixture. In a medium bowl, add cream cheese, vanilla and condensed milk. Mix together until smooth. Add mixture to the graham cracker base. Chill in refrigerator while you work on the curd. Puree raspberries and lemon juice. Strain to capture juice. In a medium pan, add sugar and egg yolks one at a time. Add lemon zest, lemon juice, salt, corn starch, and flour. Whisk together. Transfer pan to medium high heat. Whisk constantly until thick. Take the pan off the heat. Mix in cubed butter. Then pour in raspberry puree juice. Mix until the curd sets. Let cool. Add to cream cheese graham cracker base. Chill in refrigerator. Add egg whites, sugar and salt in a bowl. Give the mixture a brief whisk. Place the bowl over a pan of simmering water. Make sure the water does not touch the bowl. Whisk the egg whites occasionally while it warms up. When the mixture has warmed, whisk it constantly. You will heat the mixture until it reaches an internal temperature of 160 degrees F. Transfer the bowl to a stand mixer with a paddle attachment. While the mixture is running on low, add tablespoon sized dollops of room temperature butter making sure to let the butter incorporate before you add the next piece. Mix in orange blossom water. Transfer to 3 piping bags fitted with a small, medium and large open star piping tips. Add food coloring to each bag to create a gradient. Pipe designs using each piping bag. Cut into bars about 2 inches wide or triangles. 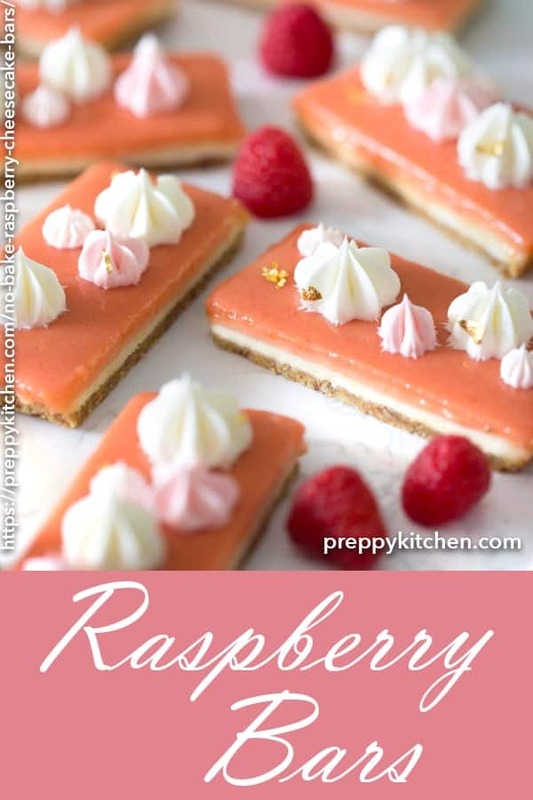 If you’ve tried these raspberry bars then don’t forget to rate the recipe and let me know how you got on in the comments below, I love hearing from you! Truly delicious no bake raspberry bars with a layer of cheesecake, a toasted pecan graham cracker base and Swiss meringue buttercream dollops on top. Crush the toasted pecans in a plastic bag with a rolling pan. In a bowl, add toasted pecans, sugar, salt and graham crackers. Mix together. Add melted butter. Press mixture into 3, foil-lined rectangular loaf pan sheets. Chill while you make the cream cheese mixture. Transfer pan to medium high heat. Take the pan off the heat. Mix in cubed butter. Then pour in raspberry puree juice. Mix until the curd sets. Let cool. Add to cream cheese graham cracker base. Whisk the egg whites occasionally while it warms up. 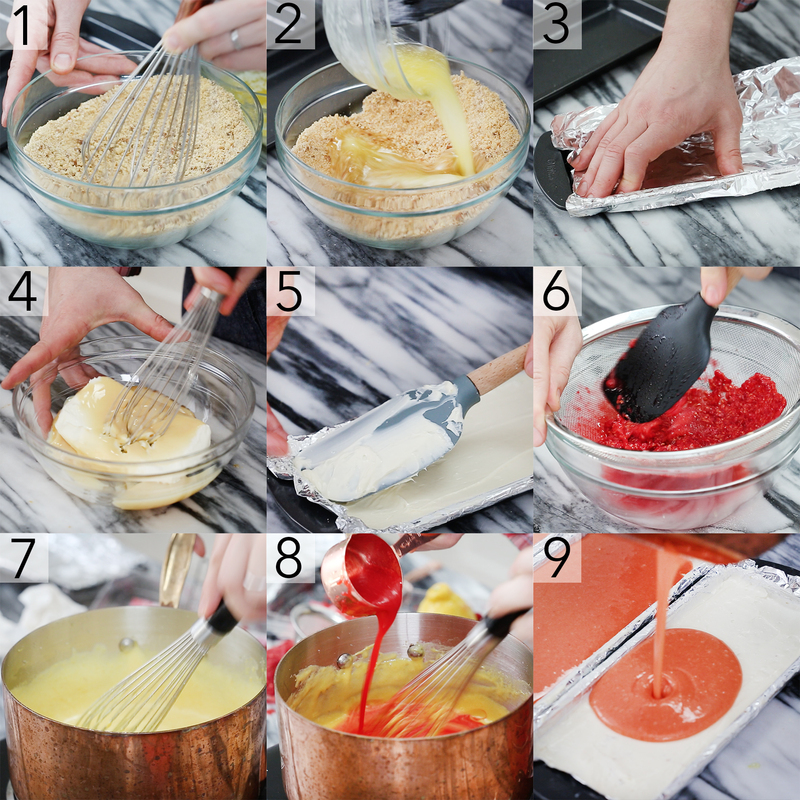 When the mixture has warmed, whisk it constantly. You will heat the mixture until it reaches an internal temperature of 160 degrees F.
Transfer the bowl to a stand mixer with a paddle attachment. While the mixture is running on low, add tablespoon sized dollops of room temperature butter making sure to let the butter incorporate before you add the next piece. Mix in orange blossom water. Transfer to 3 piping bags fitted with a small, medium and large open star piping tips. Add food coloring to each bag to create a gradient. Pipe designs using each piping bag. Cut into bars about 2 inches wide or triangles. I kind of cheated with the raspberry curd by adding a bit of corn starch and flour but I have zero regrets! It set perfectly and there's no way anyone will fault the taste. If you're not a big fan or raspberries, other fruits like strawberries, could be substituted in without a problem as long as you're just adding the juice of course. Omg yaaasss!! Do you think the raspberries could be substituted with peaches?? We have so many ripe peaches and these would be so wonderful! Just finished making these with guava so i used lime in place of lemon. They are setting up now but if licking the spoons was any indicator these will be amazing. That sounds like a clever and delicious idea! I’ll have to try that out one day.